In 2017, the public conversation around America’s use and abuse of substances focused squarely on the opioid crisis, an ever-deepening disaster that claims 91 lives each day. But beyond this justified public outcry, an older and more subtle foe has also made its deadly force clear: alcohol. According to recent epidemiological research, rates of alcohol use disorders increased nearly 50 percent between 2003 and 2013, the latest years studied. This rise leaves approximately 1 in 8 Americans struggling with alcohol abuse, with particularly troubling increases among women and minorities. While the short-term risks associated with alcohol disorders are significant, the larger health implications can be even more severe: Excessive drinking has been linked to increased rates of heart disease, stroke, and cancer. In this project, we were determined to study America’s drinking habits in greater detail. Drawing from the CDC’s Behavioral Risk Factor Surveillance System (BRFSS), we scoured the latest data to determine how Americans are drinking and which demographics face the greatest alcohol-related risks. We’ll begin with a basic metric: the percentage of adult Americans who have had at least one drink in the last month. Geographical differences prevent generalization – our data reveal massive variations among residents of different states. 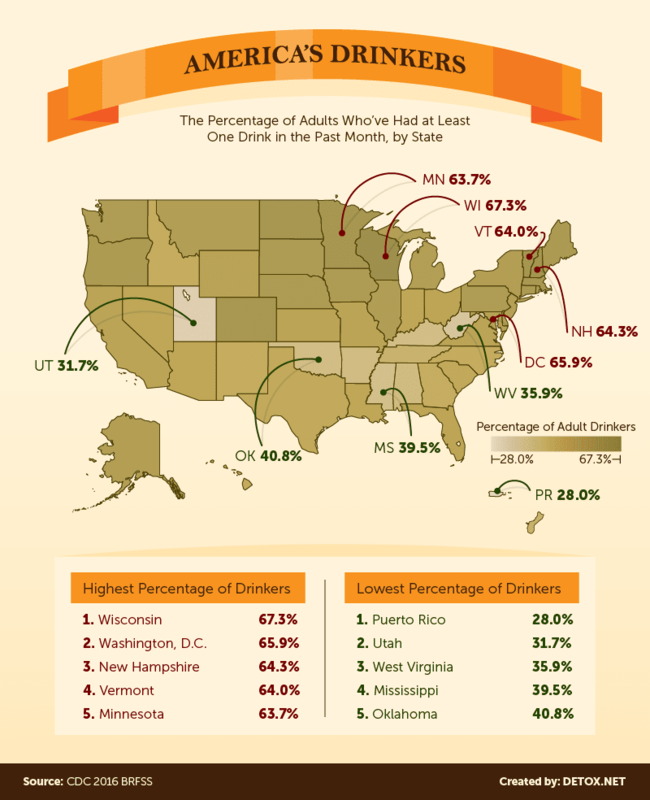 In Wisconsin, for instance, roughly two-thirds of adults had imbibed an alcoholic beverage within the last month. 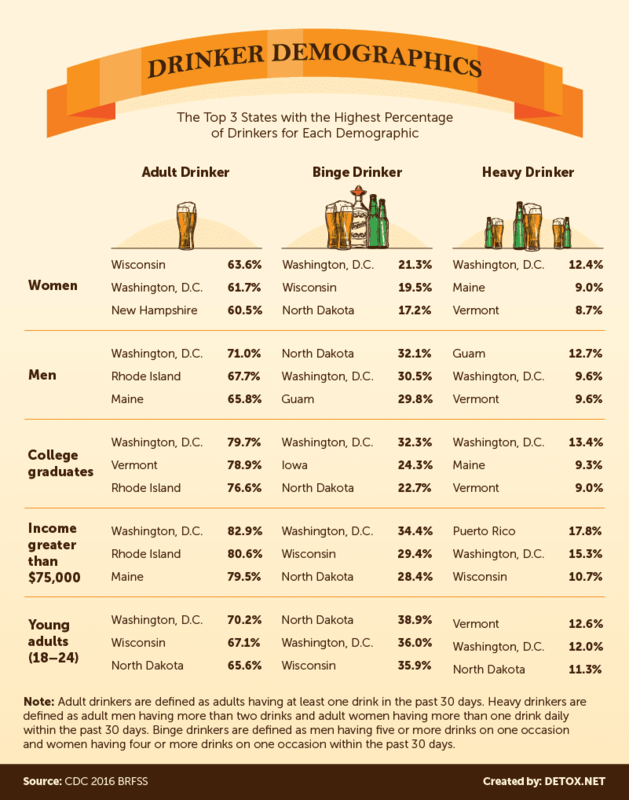 These data are consistent with a recent study of the country’s heaviest drinking cities, 10 of the nation’s top 20 fell within the Badger State. D.C., New Hampshire, Vermont, and Minnesota also made the top five, suggesting a possible connection between frigid winters and alcohol consumption that previous studies have also observed. Meanwhile, in Puerto Rico and Utah, fewer than a third of adults had taken a drink in the last month. While the Mormon population may explain Utah’s teetotaling, religious views might also explain the low rates of recent drinking in other states. Mississippi is the nation’s most religious state, and many Southern Christian denominations encourage their members to avoid alcohol. When it comes to drinking heavily, a new location tops our list: our nation’s capital. That may be a concerning metric for a city that recently relaxed its restrictions on the sale of alcohol. Vermont and Wisconsin remain near the top of our list, joined by Maine, another cold locale. Guam also made the list, though the island’s primary focus may be another addiction issue. Guam has the highest rate of smoking of any U.S. state or territory and recently raised the legal smoking age to combat that trend. 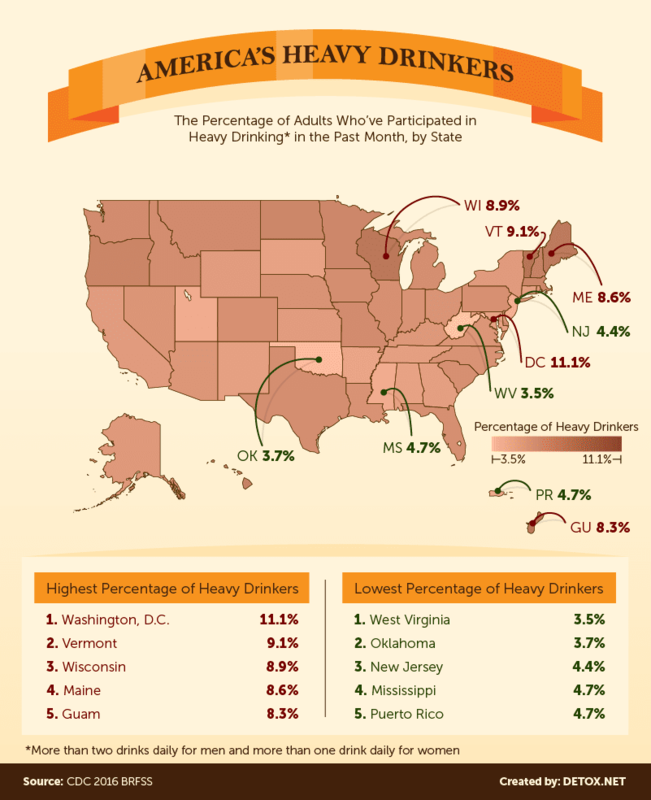 West Virginia topped our list of states with the fewest heavy drinkers. While this news is certainly encouraging, it likely does little to assuage the state’s opioid troubles – including the highest overdose rate in the nation. Other regions toward the bottom of the list, such as Oklahoma, may owe their rates to dry counties within their state. Our potentially most dangerous category of alcohol consumption – binge drinking – also occurs most frequently in Washington, D.C. The capital slightly edged out North Dakota, which was given the dubious distinction of “drunkest state” in 2017. 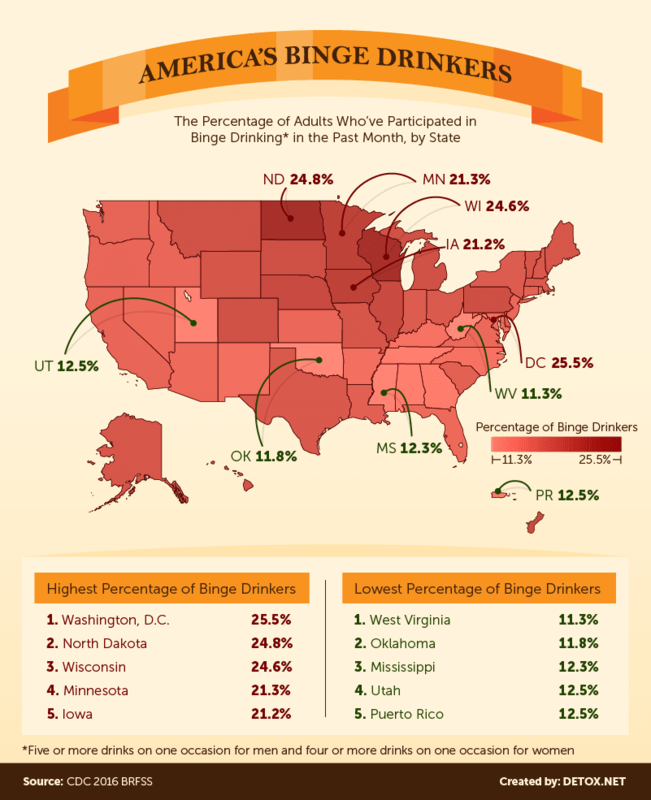 Nearly 1 in 4 Wisconsin adults report recent binge drinking as well, while Minnesota makes another appearance, and Iowa rounds out the top five. Interestingly, our bottom five binge drinking states are identical to our states with the lowest rates of drinking any alcohol at all in the last month, albeit in a different order. This may suggest a relationship between the two metrics: If a state’s culture doesn’t encourage even social drinking, fewer residents are at risk of displaying more dangerous drinking behavior as well. Moving beyond geographical comparisons, we considered a potentially related risk factor: smoking. Our results demonstrate that rates of heavy drinking and binge drinking are more than twice as high among those who smoke than those who don’t. While each habit’s respective effects are concerning enough, their combined health impact is especially troubling. Recent research suggests smoking and drinking amplify each other’s negative effects on memory. 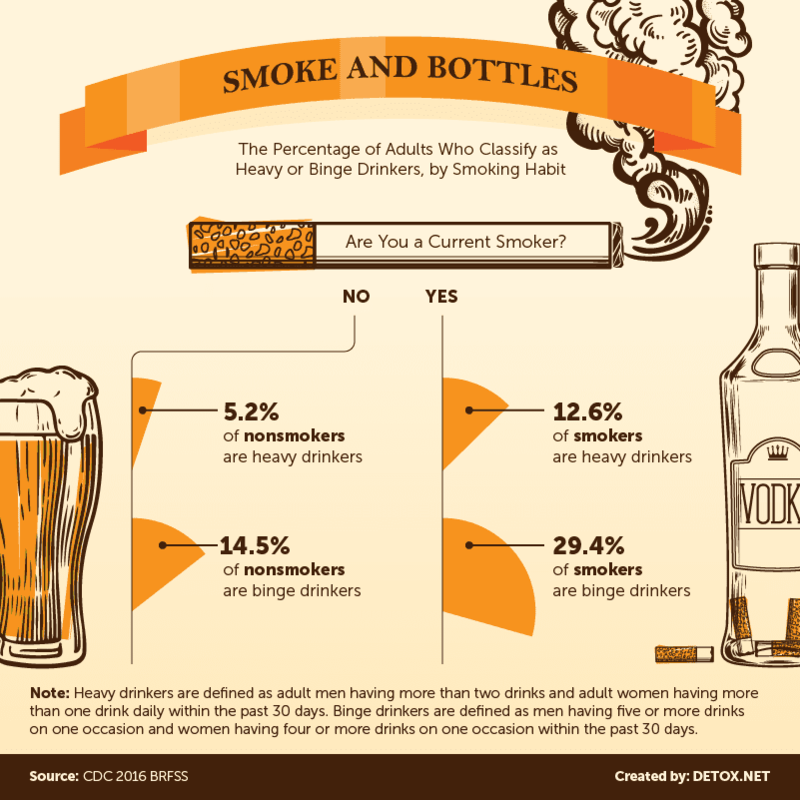 Additionally, those who smoke “socially” when drinking have little reason to believe they’re in the clear. The medical community has sought to educate the public about the risks of even occasional smoking: Even smokers who average less than one cigarette a day increase their risk of early death by 64 percent. Comparing rates of drinking among men and women, it’s clear that guys typically imbibe at higher rates than their female counterparts. Whereas less than half of women had consumed an alcoholic beverage within the last month, nearly 60 percent of men had done so. Binge drinking figures also featured a large disparity, with more than 1 in 5 men attesting to such an experience. While risks of abuse are clearly more prevalent among men, concerning recent evidence suggests women may be catching up. A recent study of 4 million people across the globe found young female respondents drink nearly as much as their male counterparts and experience harmful outcomes (such as dependence) with virtually equal frequency. 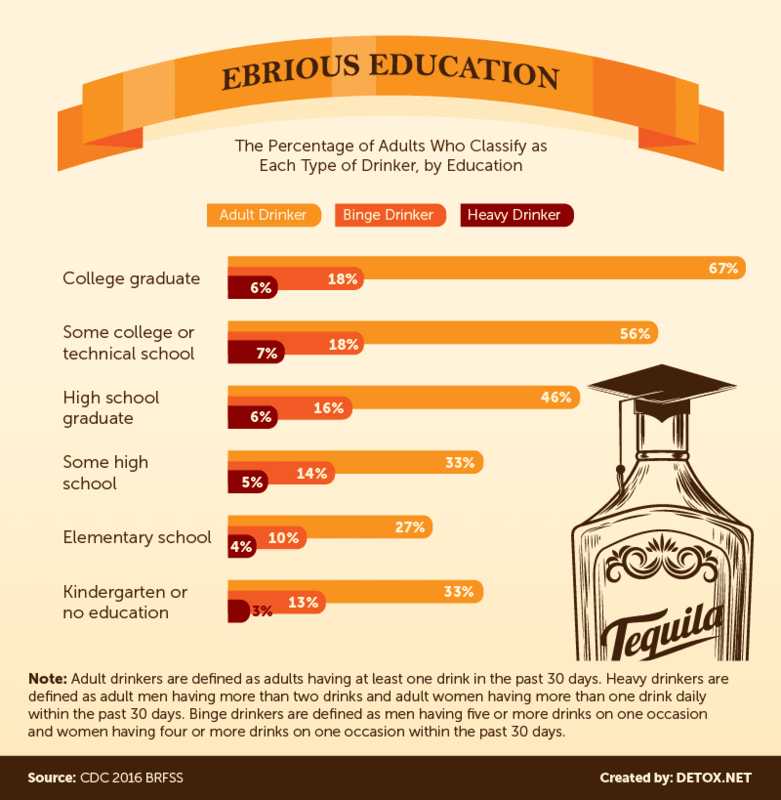 Alcohol and higher education have long been intertwined in America, and patterns of consumption reflect this influence. College graduates were most likely to drink at least one alcoholic beverage a month, were among the most prevalent binge drinkers, and were only slightly less likely than those with some college or technical school experience to engage in heavy drinking. In fact, with the exception of those who had attended only kindergarten or no school whatsoever, education and alcohol intake appeared highly correlated. These data suggest an interesting counternarrative to other measures that associate academic problems and poverty (two factors that might prevent higher educational attainment) with increased risks of substance abuse later in life. Perhaps our data then illuminate a distinction: While heavy and binge drinking are concerning indicators of potential problems, they’re not intrinsically synonymous with alcohol abuse disorders. Here again, income and alcohol use seem highly correlated, with the exception of those earning less than $10,000 annually. These findings confirm the conclusions drawn from other recent research: Wealthy folks tend to drink more, but also see lower rates of alcohol-associated illness, such as cirrhosis. Some attribute this phenomenon to expense and accessibility: Wealthy people tend to live in urban areas and can afford the price of cocktails at the bar on their corner. So then why is alcoholism more common among those who live below the poverty threshold? Perhaps wealthy drinkers mitigate the risks of alcohol consumption through the use of other resources. Access to healthy foods, exercise, and medical and mental health care could all serve to prevent or reduce the impacts of serious drinking. While we’re more inclined to associate partying with our younger years, our data show that drinking doesn’t taper off entirely as we age. 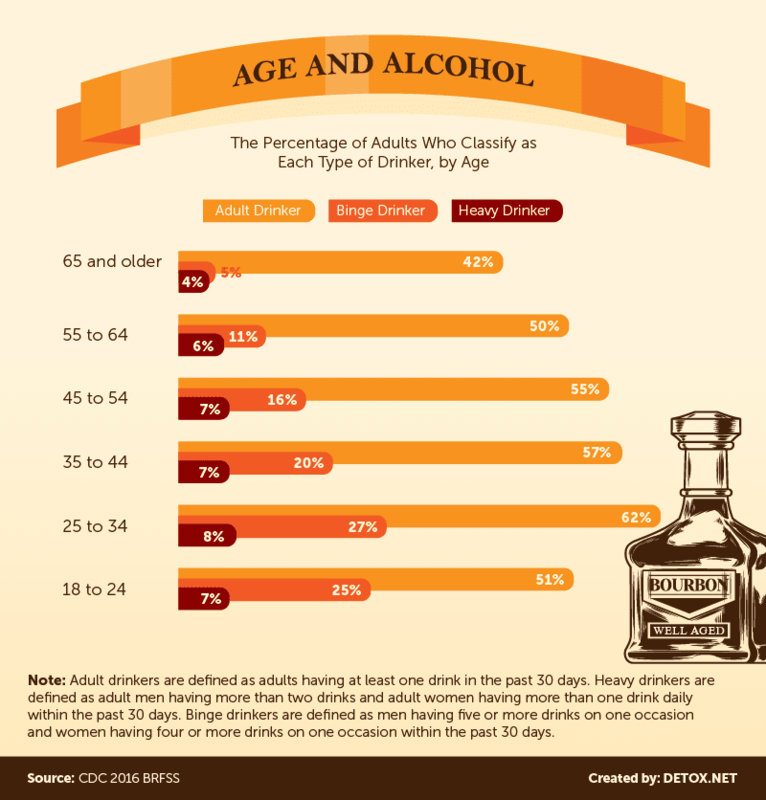 In fact, at least half of American adults of every age group younger than 65 had a drink within the last month. Binge drinking declined in older age groups, from roughly a quarter of all people younger than 35 to just 11 percent of those 55 to 64. But heavy drinking was relatively consistent among all but our oldest group, suggesting a small minority may maintain a significant habit as they grow older. Recent research has prompted concerns regarding drinking among America’s elderly, however. One study observed a 106.7 percent increase in alcohol use disorders over a 10-year period for those 65 and older. Thus, despite encouraging indications of reduced binge drinking among some college-aged Americans, the country may be facing a crisis among members at the other end of the age spectrum. Finally, we juxtaposed the various groups of drinkers we studied against the states in which they lived to see which and where populations drink most. While some familiar places such as Wisconsin, North Dakota, and Washington, D.C., make repeated appearances across demographic categories, some interesting observations emerged. Rhode Island, for instance, has the second-highest rate of male drinkers, despite not appearing near the top in any of our prior state rankings. Meanwhile, Puerto Rico, one of our lowest-ranked states for heavy drinking overall, actually had the highest rate of heavy drinking among its wealthy residents. 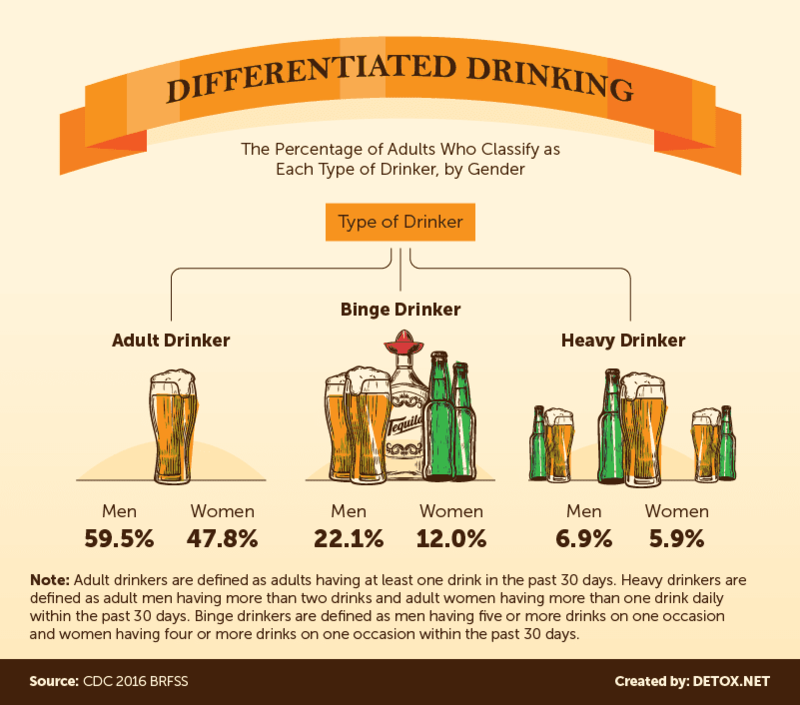 These details serve to remind us of the subtlety of drinking culture: Drawing broad generalizations may be misleading. 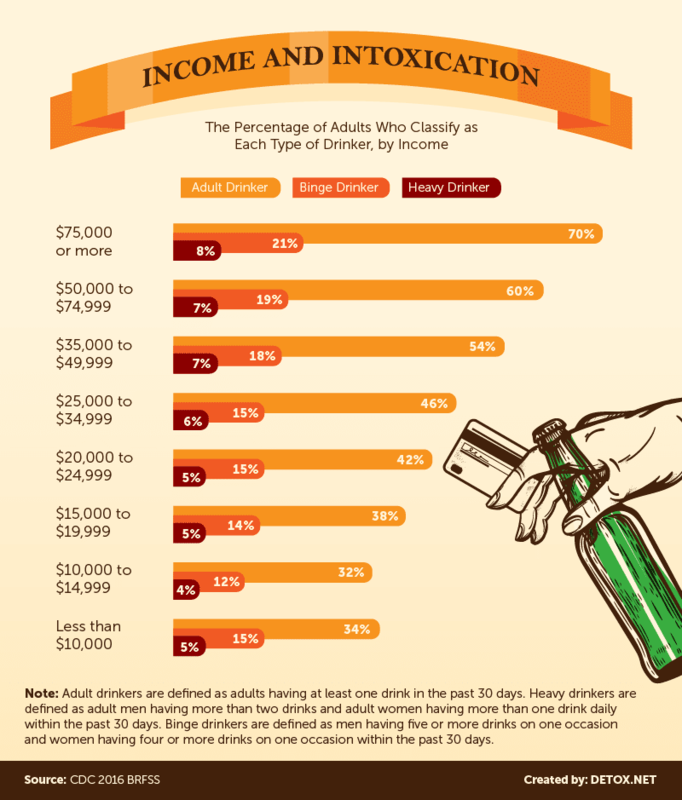 While these statistics show how common and concerning Americans’ drinking habits may be, no figure can fully account for the pain and destruction alcohol abuse creates across our nation. We hope this project conveys just how deeply alcohol is embedded in the fabric of our country’s culture and raises awareness of the public health risks this reality entails. But beyond broad observations of American drinking habits nationally, our most important message is more personal: If you’re struggling with alcohol abuse and dependence, you are not alone. At Detox.net, we strive to provide comprehensive resources for families and those struggling with addiction. From educational material to advice on finding appropriate and affordable care, we’re here to play our part in helping people along their path to recovery. The CDC’s Behavioral Risk Factor Surveillance System (BRFSS) completes over 400,000 adult interviews yearly, collecting data from all 50 states, as well as the District of Columbia, Puerto Rico, and Guam. To calculate our percentages, we used the final weighting variables offered by the BRFSS and CDC. The final weighting variables indicate how many people the respondents represent. BRFSS is weighted by the CDC to estimates of the non-institutionalized, adult (aged 18 and older) population for each state. One benefit of having CDC do this for all states is that it ensures a consistent methodology is used for population estimates for all states. One potential disadvantage is that some states feel their population estimates are not as accurate as they could be. If you want to share this information about America’s alcohol habits, we welcome your help in spreading the word for noncommercial purposes. Please provide a link to this page so that your audience can explore this project’s important findings in their entirety.